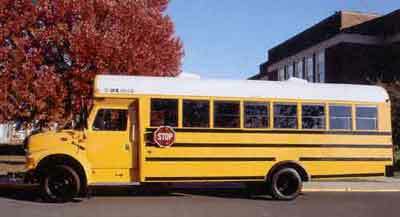 Looking for Parts for an IH school bus chassis? We can help! While continuing to produce the "3000" series chassis in Springfield, IH began producing the IH/IC (integrated conventional) with a new hood design. The IH/IC evolved into the BE200, CE200, and CE300 models. Beginning in 1990 and continuing until about 2002, IH built the "3000" series chassis as a replacement for the "S" models of the previous decade. 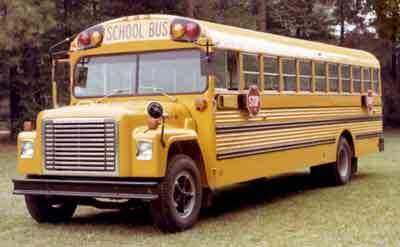 Full size conventional Type-C models were "3700" and "3800" and engines available were the V8 6.9L, 7.3L, T444, and the 6-cyl "DT" series. In the early 1990's, IH produced the model 3600 chassis and gave Thomas exclusive rights to produce their "Vista" body on it. Although the "Vista" offered good visibility for the driver, the product was considered un-attractive and did not sell very well. In the middle 1990's, U.S. 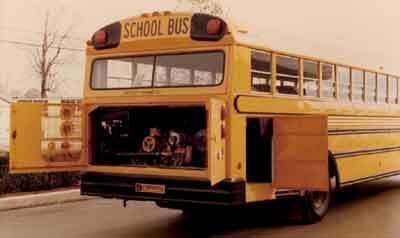 Bus Corporation utilized a few IH model 3400 chassis for production of some large Type-A buses. 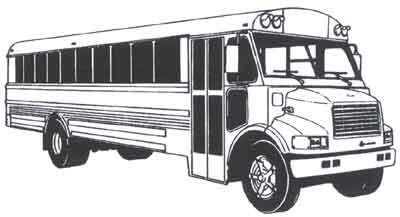 Note the driver's entrance on the left side of the bus. From 1979 thru 1989, IH built the "S" Model Tyfpe-C Chassis. Gas engines were slowly phased out in the mid 1980's. Models 1723 and 1823 were equipped with gas engines. Models 1753 and 1853 were equipped with diesels. Beginning around 1972, IH began offering a "tilt-forward" hood that allowed easy servicing of the Type-C chassis engine. 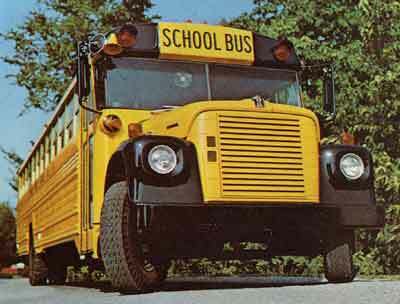 The IH tilt-hood option was a "first" in the school bus industry and caused competitors to engineer similar cowls soon after. IH models using this option were: Loadstar 1603, 1703, 1753, 1803, and 1853. The Loadstar series began in 1962 and was phased out at the end of 1978. Pictured at left is the "steel hood" model that was popular in the early years. 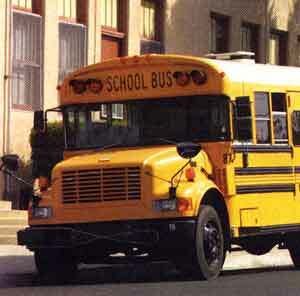 Model numbers for this series were: Loadstar 1603, 1703, 1753, 1803, and 1853. 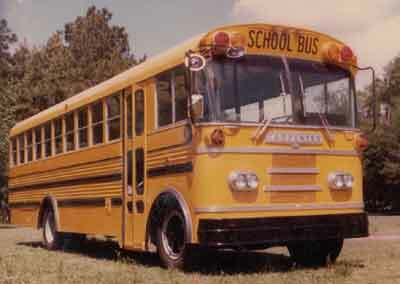 In the 1960's and early 1970's, IH produced a series of "rail" chassis that were used for production of transit style "flat-nose" buses. The 183-RE and 193-RE rear engine chassis were powered by V8 gas engines up to 549 cubic inches. Production of the 183-RE and 193-RE ceased around 1973 and IH did not build any rear engine chassis until about 1996 when the 3000-RE was introduced. This chassis evolved into the RE200 (powered by V8 diesels) and the RE300 chassis (powered by DT-466 diesels). The 1853-FC forward engine chassis was originally powered by various sizes of the famous "Red Diamond" in-line 6-cylinder gas engines when it was introduced in the late 1960's. Later versions of the 1853-FC were built with 9.0L V8 diesels and the DT-466 in-line 6-cylinder engine. Production of the 1853-FC model continued until about 1989. The 1853-FC evolved into the 3900-FC chassis that was powered by the DT-360 and DT-466 diesels. Production for the 3900-FC began in about 1990 and continued until around 2002. 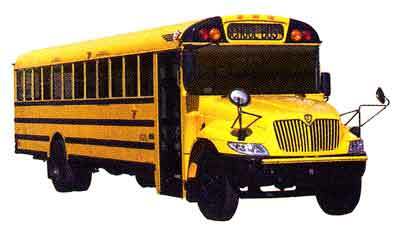 The 3900-FC evolved into the FE300 chassis that is powered by the DT-466 engine. 1610-FC and a few buses were produced using this V8 gas powered chassis. 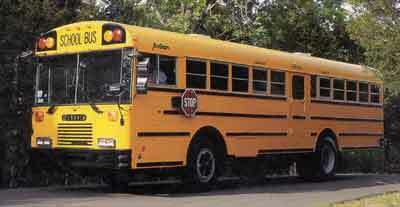 Pictured at right is one of only two 1610-FC school buses known to have been produced. 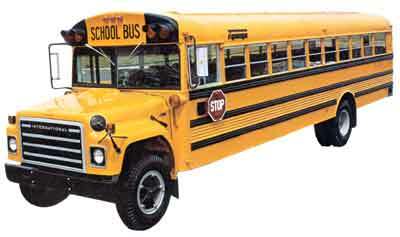 Note that the front axle is located ahead of the entrance door making this bus more like a very large Type-B.